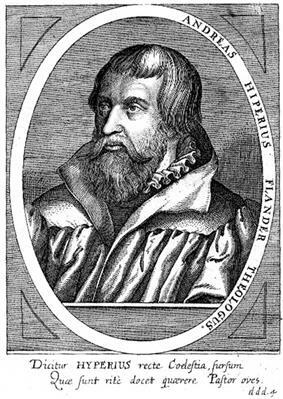 Andreas Gerhard Hyperius (1511–1564), real name Andreas Gheeraerdts, was a Protestant theologian. He was Flemish, born at Ypres. He had a humanist education, and studied at Tournai and Paris. He was resident in England from 1536 to 1540, and in 1542 was appointed professor of theology at Marburg. His theology lies between Lutheran and Reformed beliefs. Influenced by Martin Butzer, he was not a strict Lutheran. Jean Calvin endorsed his erudition. He wrote the first Protestant text, De formandis concionibus sacris (On the Making of Sacred Discourses), solely devoted to systematic homiletics, in other words preaching considered as a branch of rhetoric. It was translated in English by John Ludham, as The Practise of Preaching (1577). Another English translation by Ludham was A Speciall Treatise of Gods Providence (c. 1588). Dietrich Bonhoeffer emphasised the role Hyperius had played in early Protestantism. The Methodus theologiae is a selection from, and method for reading, the Church Fathers. In his overall approach, he sought a firm basis in the Bible, rigidly, and held that before practical theology can be put in force, it must be made a part of systematic theological study, and must not be taught fragmentarily. Demanding an immense amount of preliminary reading on the part of the student, covering all practical theology except missions, he held that such reading would involve preparation for the practical work of the ministry. All must be squared with the Bible, or, where the Bible did not contain specific data, with the commandments of love for God and one's neighbor. In addition, he urged the preparation of a work on church government, including the data of the New Testament, relevant portions of church history, excerpts from the councils, papal decrees, Church Fathers, and works on dogmatics, liturgics, and related materials. Methodi theologiae, sive praecipuorum christianae religionis locorum conmunium, libri tres (1568). ^ Heinrich F. Plett, Rhetoric and Renaissance Culture (2004), p. 27. ^ Christopher Mattinson Dent, Protestant Reformers in Elizabethan Oxford (1983), p. 90. ^ Larissa Taylor, Preachers and People in the Reformations and Early Modern Period (2001), p. 51. ^ David L. Larsen, The Company of the Preachers: A History of Biblical Preaching from the Old Testament to the Modern Era: Volume 2. (1998), p. 803. ^ Irena Backus, Historical Method and Confessional Identity in the Era of the Reformation (1378-1615) (2003), pp. 197-203. Friedrich Wilhelm Bautz (1990). "Hyperius (eigentl. Gheeraerdts, Gerhard), Andreas". In Bautz, Friedrich Wilhelm. Biographisch-Bibliographisches Kirchenlexikon (BBKL) (in German) 2. Hamm: Bautz. cols. 1233–1235.